He was from Surin, in the Northeast, but had been abroad and spoke English well. This had given him some perspective, and although he was a native Thai, he was able to see the city as a foreigner might see it — he could see the mystique of this place. Outside the coffee shop, colorful canal boats hummed past, and a long barge covered with tarpaulins was being pulled by a tugboat, heading south towards the Gulf of Thailand. The back door of the tugboat was open, revealing a small kitchen inside, with some dishes and glasses drying on a rack. The boat driver was standing on the back deck, a sarong around his waist, rinsing himself with water from a pail — his morning shower. 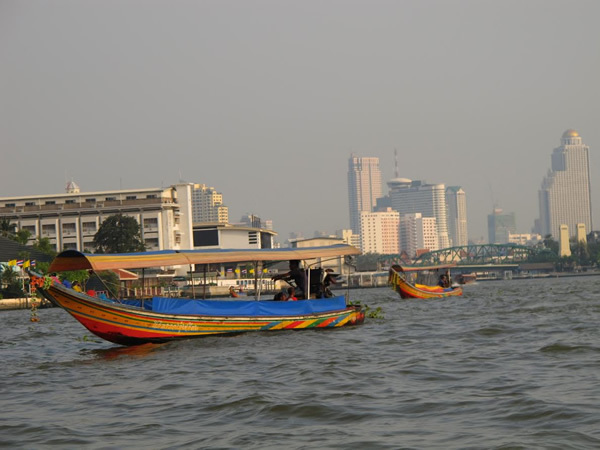 From where we were seated overlooking Wang Lang Pier, we could see children jumping in and climbing out of the water, laughing and splashing each other, while old men sat shirtless on the embankment, smoking hand-rolled cigarettes. The sun was out, and it reflected off the surface of the water, caught against the golden spires of the Grand Palace on the far shore. “There’s no other place like it in the world,” I said, not looking at him. When I was in my junior year of undergraduate study in the US, I found out about an international volunteer program called Cross-Cultural Solutions based out of New York. Their program in Trang, in southern Thailand, caught my eye. Shortly thereafter, I signed on for a 1-month placement teaching English in a high school there between my semesters at college. When that month ended, I did not want to leave. You could say I had a good experience, but it was much more than that. I recently was in contact with a girl with whom I had co-volunteered, three years ago. “There was something about that place,” she wrote to me. “I’ve never felt so free in all my life.” I knew what she meant. In Thailand, the sense of freedom had been exhilarating. The downside was that when I returned to the US, I had felt cramped — home had become a kind of prison. Maybe it always had been, but now because I had seen what was out there, beyond the prejudices and cultural pressures of the places where I had grown up and gone to school, I saw the walls around me. I realized I hated everything that was expected of me as a college graduate with a chemistry degree. Well-intentioned people were pushing me to go on to graduate school, to have a career of some sort. And maybe, had I listened to them, I could be going on to attain the kind of things people consider to be “success” in America right now. But what would be the point of that, if it would all just make me miserable, if I would have to sacrifice my dreams of travel, learning a foreign language, and writing in order to fit some kind of mold? This question is one that only a very old man asks. Does this path have a heart? All paths are the same: they lead nowhere. There are paths going through the bush, or into the bush. In my own life I could say I have traversed long, long paths, but I am not anywhere. Does this path have a heart? If it does, the path is good; if it doesn't, it is of no use. Both paths lead nowhere; but one has a heart, the other doesn't. One makes for a joyful journey; as long as you follow it, you are one with it. The other will make you curse your life. These words, from Carlos Castaneda’s The Teachings of Don Juan, hit me like a train at the time, and everything suddenly became very clear. I vowed to finish my degree, and then I would get on a plane and go back to Thailand. I would do what I had wanted to do at the end of my tenure with Cross-Cultural Solutions — I would live and stay in Thailand, for as long as it felt right. This was my path with a heart. As I write this now, it has felt right for eighteen months. 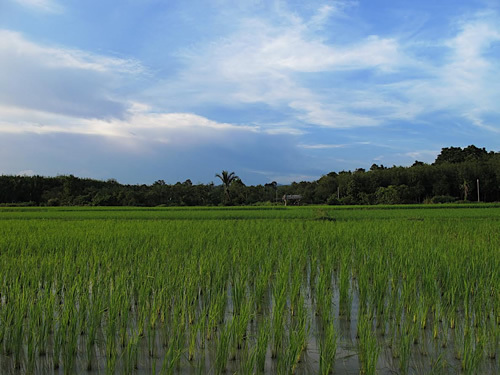 Rice fields in Southern Thailand are very peaceful and beautiful. Moving abroad where you do not speak the language is necessarily going to be difficult, but there are ways to ease the transition. During my senior year of college, I applied to a 1-year international program in Thai Studies at Thammasat University in Bangkok. I would be moving to Bangkok, but I would be taking courses in Thai language, history, and culture, with various students from the US and Europe. This way I would be living with a community of English speakers for nine months while I learned Thai and adapted to the culture—it was a way of learning to swim in the shallow end before diving off into the deep end. It was also a wonderful way to experience Bangkok, as the program at Thammasat offered all kinds of activities and field trips in and around the city. I am not sure if I ever believed I would learn Thai. But I wanted to learn it badly enough, and I was willing to work at it. The course I took introduced us to Thai using a special Romanized version of writing the script, not unlike Chinese pinyin, before introducing the Thai letters to us one at a time. We were given worksheets with stenciled outlines of the characters, and then we would imitate the strokes over and over again, like students in primary school. I had studied German in high school and in college, but that had used the same alphabet, shared common phonetics, and common roots. Learning Thai was like starting all over again — a return to infancy, learning to crawl. The Thai characters are mysterious, almost more like runes than letters, and with each new one that I learned I felt closer to unlocking some kind of secret. And in small ways, I began to. After some time, I could read bus placards and see where the buses were going—I no longer had to rely on asking the staff at my apartment which bus to take to get somewhere. I learned to read menus, which increased my options of where I could eat, as well as expanded my palate to all kinds of new and delicious Thai foods. Now, eighteen months on, I would say my reading level is probably similar to that of a 6th or 7th grader. I can read easy books and get the gist of what’s in the newspaper, and I am still working at it each day. The further south the train had gone, the greener and greener the countryside seemed to become. It had been a 12-hour overnight trip out of Bangkok’s Hualamphong Station to Huai Yot, the small town in southern Thailand where I now live and teach. While there are an almost endless variety of ways to find employment as a teacher in Thailand, I had found my current job through the teacher I had worked with three years earlier, during my time as a volunteer with Cross-Cultural Solutions. I had kept in touch with her, and she had arranged the job for me at a different school in the same province. In this roundabout way, I have returned to the place where I first encountered Thailand. During my time studying in Bangkok, I took a 60-hour online TEFL (Teaching English as a Foreign Language) course in order to be certifiable to teach in Thailand. Because I was personally recommended to the director of my school, this was not an issue, but typically, online TEFL certificates are viewed as inferior to the hands-on courses where you actually spend time in a classroom — and for good reason. There is no way that watching a video on classroom management can give you the same kind of experience that comes from being in a room full of students and managing them yourself — something I learned the hard way during my first few months. I had signed a 1-year contract with the school to teach eighteen periods per week of Mathayom 1, the equivalent of seventh grade in the U.S. I remember how I used to behave when I was in seventh grade, and, Thailand being a predominantly Buddhist country, it has crossed my mind that getting a job teaching classrooms of 47 twelve- and thirteen-year-old kids must be karma at work. But if it is, then my karma must be pretty good. While I have had to use my Thai at times to reprimand, scold, and maintain order, there is no faster way to learn the Thai words for “quiet” (ngiap), “sit down” (nang luy), and “you are gone!” (ook pai luy!) than to teach in a Thai public school. In the one year that I have taught here I have seen the improvements in many of the kids and have established a real rapport with them. While I mention the need to manage younger learners and set limits, the majority of my students are lovely kids and are not problematic. If you can deal with the inevitable visa and working paper hassles that come with teaching in Thailand, the job itself can be very rewarding. And you cannot beat the location for when school holidays come around and you have time to travel. Now that I have got over my initial greenness with the job and am pretty comfortable in the classroom, I have come to love it here in Huai Yot—so much so that I have extended my contract to teach my same students again next year, in Mathayom 2. There is a Zen saying that I like: “Leap and the net will appear.” It sounds nice, but it is actually profoundly scary in practice — we can never see the net until we are well over the edge of the cliff, and by that point there is no turning back. Leaping is all or nothing, and there are moments during freefall when you question (perhaps beat your head against a wall is a better way to describe it) what you have chosen for yourself. I had my own moments, midair, where the net was nowhere to be seen—times when I thought I would never get the language, times when I felt I would never be able to manage forty-seven kids, times when I felt I would be destroyed by the loneliness of living in such a foreign place. But in the year and a half since I made my own leap, I have come to see the truth of this saying. After many months of a long rainy season in southern Thailand full of self-doubt, the clouds began to part for me, both literally and metaphorically. Suddenly I was finding work as a travel writer and photographer, writing for print magazines and online blogs. It dawned on me that my language had become good enough so I could ride a motorcycle anywhere in Thailand and explore places no Westerners ever go. I could work as a translator, teach English to the staff at a high-end beach resort on the weekends, or I could just play my guitar and sing at a local pub. I realized that I really liked my job and that all of these other opportunities appealed to me, too. A wise man once said to me, “At some point in this life, you’ve got to jump off the face of the earth.” He was speaking from experience; he had jumped, and landed in Peru, where he now runs a tour company in the Amazon. When I landed in Thailand, on the other side of the world, we began to correspond more frequently about our lives as expats, and I reminded him of what he told me those years ago. He laughed. I have no idea whether or not this guy is a Zen Buddhist. But I trust now that he knew what he was talking about. History: For a historical perspective on Thailand, B.J. Terwiel’s Thailand’s Political History: From the Thirteenth Century to Modern Times is an excellent resource. The most recent edition features a new chapter on the current political situation in Thailand, tracing the rise and fall of controversial Prime Minister Thaksin Shinawatra, and the resulting Red Shirt/Yellow Shirt schism in the country. Food: The long-term resident of Thailand will have ample time to discover just how rich Thai cuisine is, and why it is considered one of the best in the world. From the Northeastern delicacies of som tam and laap spicy salads, to southern curries such as panang and massaman, there is much to discover. Do not shy away from Bangkok street vendors—this is probably where you can find some of the best food for cheap. Thai Food, by Australian chef David Thompson, who spent much time in the country studying the street cuisine, is a great resource for those looking to learn more or to cook some of these dishes themselves. AUA Language Center is the best-known language school in Thailand. The school has over 18 branches throughout the country, with six located in Bangkok. The course scheduling is flexible, allowing you to pick and choose blocks that work for you. Ajarn.com is the premier resource for teaching English in Thailand, with new job listings updated daily. This incredibly helpful site also has monthly blogs by current TEFL teachers in the kingdom, as well as detailed FAQs and guides on dealing with visas, work permits, health insurance, and regional information on teaching in Bangkok and in the provinces. Thaivisa.com is a very helpful website for dealing with inevitable immigration red tape, as well as one of the best online forums for expats in Thailand. See our section on Living in Thailand: Articles and Expatriate Resources for more information. Upon graduating with his degree in chemistry from the University of Delaware in 2009, Paul King moved abroad to Thailand, where he lived, studied, and worked for three years. He returned home to the US in 2012, and now writes fiction and non-fiction from Asbury Park, NJ. You can check Paul's other work out at www.paulkingwriter.com.